Snap Frames- Sign Frame size A3. Aluminium Frame in Matte finish, with Mounting Hardware. These clip frames or sign frames can be used for places such as shopping malls, exhibitions or banks. Constructed using extruded aluminium, the frame is finished in matte silver to compliment your in-store graphics. Mounting hardware is also included with the A3 snap frame; the frame itself has been prepared with mounting holes for your convenience. 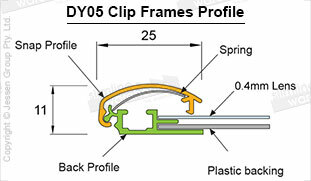 The uses for these clip frames are endless and they can be easily updated as they are constructed with a snap frame. 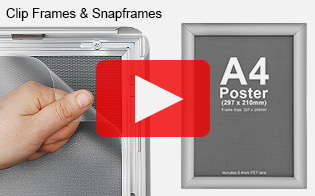 The snap frame’s artwork can be easily changed by simply lifting the frame sides. Artwork sits behind the protective plastic lens which is included to not only protect the artwork, but to also stop light reflecting off your artwork. Your frame can be mounted onto flat surfaces and be displayed as either landscape or portrait. More clip frame sizes include A0, A1, A2, A4 & we also stock a larger 1700 x 600mm, 870 x 327 mm size. 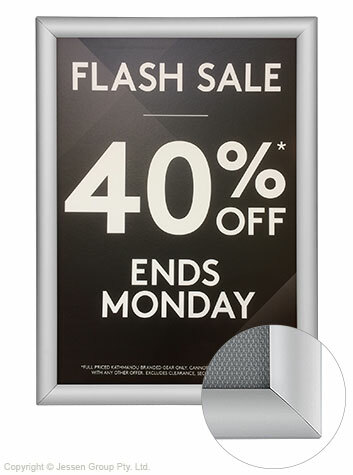 As the snap frame is finished in matte silver, the sign frame will suit many of your advertisements and promotional signs. All our clip frames are individually packed to avoid any chance of damage during shipment andwe ship sign frames Australia wide. If you like this product, you may also like the Sages System poster stands, Budget Poster Stands or A Boards.